Obviously, he has a lot to learn about the proud traditions of our foreign service. In the first place, Wisma Putra is not a spy agency with embassies abroad keeping tabs on the activities of Malaysian citizens. That is something that countries like North Korea, China and Iran do. In all my 36 years in the foreign ministry, we never spied on our citizens, kept records of their activities or threatened them. In fact, we went out of our way to build rapport with them because we recognized that they could contribute to promoting Malaysia. Of course, there were times when we disagreed with their actions or the positions they took on national issues. Our response, however, was always to engage them, explain government policies and endeavour to win them over. We won some and we lost some; that’s the way it goes in a democracy. Whatever the outcome, the Malaysia I represented then always respected the rights of its citizens even when we disagreed with them. There was no question of trying to intimidate them. Sadly, this is something that the present crop of UMNO politicians do not seem to understand. To them, all dissent is seditious and unacceptable. Instead of respectfully engaging dissenting citizens with tact and diplomacy, they threaten, demean and dismiss them as enemies of state to be pursued, harassed and intimidated. And then they wonder why more and more people are disgusted by their behaviour. I suppose morally bankrupt politicians have few options. They dodge the truth, distort the facts and evade the issues. When that fails, they hide behind race and religion. And when even that fails, they fall back on threats and intimidation. It is particularly distressing that Reezal is now bringing this mindset to a once proud institution like Wisma Putra. Instead of using Wisma Putra to advance and defend the national interest in critical areas of global diplomacy and security, he has reduced it to just another party political organ where diplomats have to set aside the important work they do for the nation to cater to UMNO’s desire for vengeance against fellow citizens. This is what happens when you put small-minded politicians with oversize ambitions in the foreign ministry. Reezal was also reported to have said that the actions of protestors abroad could tarnish the image of the country at the international level. You have to be asinine to believe that. Any one with a modicum of common sense and understanding about international affairs would know that it is the behaviour of the present government that has brought the nation into disrepute with its scandalous behaviour, gross incompetence and abuse of power. If Reezal cares to do his job and acquaint himself with what the international media, other governments, respected NGOs and investors are saying, the deputy minister would know that his accusations against Malaysian protestors abroad are utter nonsense. When it comes to tarnishing Malaysia’s name, UMNO is in a class of its own. The deputy minister is also talking nonsense when he says that other countries don’t appreciate Malaysians taking to the streets. 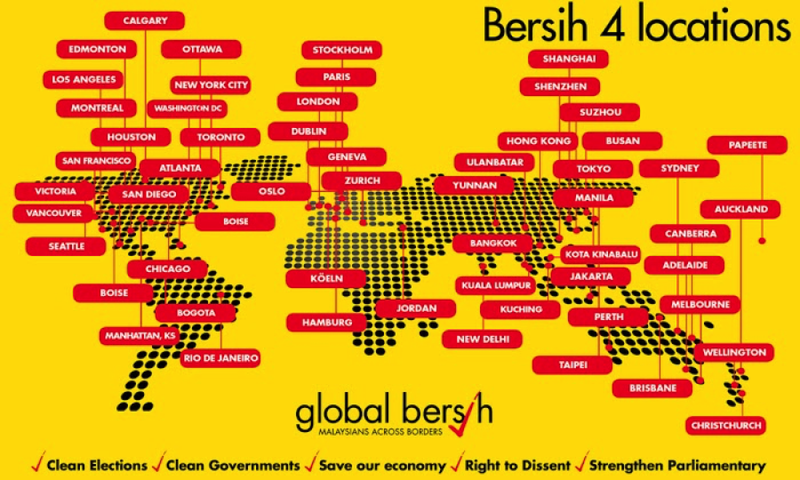 As far as I know, not a single democratic government has sought to prevent a BERSIH gathering. Democracies understand that people have constitutional rights to peacefully express themselves. It is only undemocratic and insecure governments that get their knickers into a knot every time there’s a protest or feel threatened by balloons or yellow tee-shirts. Reezal also went on to offer gratuitous advice to Malaysians abroad to comply with the laws of the countries they reside in. He would have better served the nation if he encouraged his own colleagues in government to abide by the laws of the land and respect the constitutional rights of Malaysians. For my part, I salute, without reservation, the thousands of Malaysians abroad who joined their countrymen at home in demanding free and fair elections, an end to the endemic corruption that is bleeding our nation dry, and good governance. They are like shining lights on a hill reminding the world that though the situation at home is bleak there is still hope because millions of Malaysians still carry the torch of freedom in their hearts. I am inspired by their patriotism and commitment to our nation.